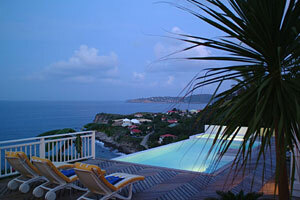 Villa Arc En Ciel is a four-bedroom, four-bath villa set high on the hillside with spectacular views and total privacy. This property offers a unique Mexican theme with gorgeous tile work throughout. Equal king bedrooms with ensuite bathrooms offer each couple separation. There is a new heated infinity edge pool with overflow Jacuzzi attached surrounded by a spacious deck. The large kitchen is designed for the gourmet cook and overlooks the fabulous sunken living room with ample glass to enjoy the view from all angles. A raised dining terrace is also available and offers breathtaking views. The fourth bedroom was added in 2003 and is separated from the main house for ultimate privacy to its occupants. Non-smokers please.